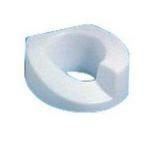 Commode Splash Guard, 17" X 14" X 16.5"
Commode Splash Guard, 17" X 14" X 16.5". Sold By The Case Of 12. 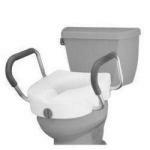 Rotation Molded Raised Toilet Seat With Extra Wide Arms. 5" High X 15" Wide X 16 1/2" Long X. 21 1/2" Wide Between Arms. Weight Capacity 300 Pounds. Elevated Toilet Seat, Left Cutout. 16" Long X 14 1/2" Wide, Inside Measures: 10" Long X 8" Wide. Assists Persons With Postsurgical Or Traumatic Injuries Who Need An Extended Hip Position. Adds 4". 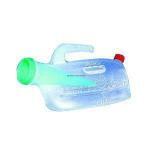 Spill-Proof Male Urinal, 1 Liter (32 Ounce Capacity). Strong Light-Weight & Practically Odor Free. 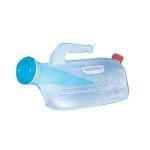 Anti Reflux Spout Allows For Spill Proof Use, Even If Knocked Over. Spout Requires No Cover. Volume Measurements Are Marked In Raised Graduations On The Side Of The Container To Measure Output If Needed. Screw Cap On Back Is Used To Quickly Empty Contents. Latex Free.